I have never, ever made a crochet dishcloth before! They are simple and easy to make, but for some reason I've never quite gotten around to making one. After using pink cotton to make the rock sweaters (haha), I decided that making a pink cotton dishcloth would be fun... and guess what? It was! A bunch of these would be a fabulous Christmas gift (don't worry family and friends... I'm not going to be giving you all dishcloths for Christmas this year). If you are a newby to crochet, this pattern should help you get started at making your own dishcloth. I love using crochet dish cloths! I made a few for myself a couple years ago and they are still going strong. I also love how "green" they are. Just wash and reuse. I use them for wiping counters, washing dishes, and cleaning! I love making them too! LOVING that pretty pink! Congrats on entering the world of crocheted dishcloths! 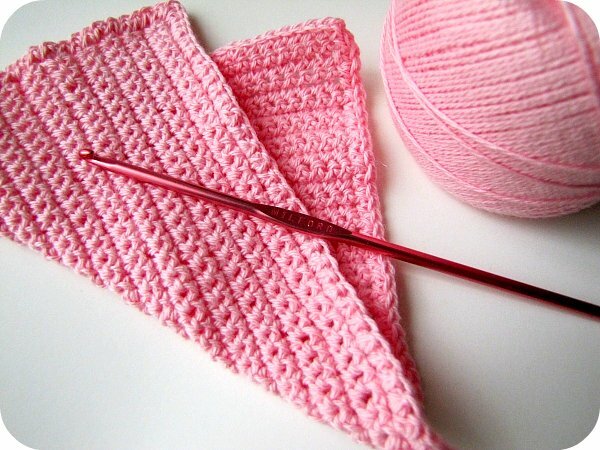 I remember a neighbor I once had that made me a crochet dishcloth and I absolutely loved it!! Yes yes to crochet dishcloth gifts (i'm sure you're family would be appreciative) hahaha! Ha ha - perhaps you're onto something there - maybe the children's stockings should ahve a cleaning theme - they'd never forget the 2011 Christmas if you did! pssssst you inspired me, I am doing exactly that with some skeins of cotton I had left... so relaxing. No color picking, no thinking, just chain 34 and go. Love it. lovely lovely, thanks for the wonderful idea!